I now have two #1 favorite outdoor activities in my life. One is the High Sierra Camps Loop HIke in Yosemite National Park, California. 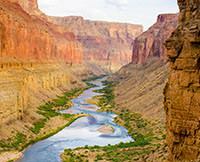 The other is my 7-day trip down the Colorado in the Grand Canyon with Western River Expeditions. Everything I could possibly say about the trip is on the above website. I wish I could do it again but that trip was so perfect I fear the second trip might not measure up.